Desensitisation and counter-conditioning behavioural modification can be utilised to successfully treat anxiety due to noise phobia. Two By Two Veterinary Centre has, for your convenience, listed our top 5 tips for preparing your pet for Bonfire Night below. Start preparation early. By preparing in advance before fireworks start, your pet will be better able to cope with the loud sounds. This could be to allow behavioural therapies to have time to achieve results or to source medical or nutritional supplements, some of which need to be administered for a couple of weeks in advance to have a noticeable calming effect. Consider using sound desensitisation soundtracks in the week(s) leading up to Bonfire Night. When played in the background at home, exposure to progressively louder sounds can condition your pet to stop having such an exaggerated fear response to fireworks. Remember that fireworks tend to start at dusk so take your dog for a walk in the afternoon, rather than the evening. Keep pets indoors and catflaps/windows closed over for at least one hour before dusk. By creating a softly padded space, or ‘den’, a safe haven from the sounds, lights and vibrations of fireworks being set off can be fashioned for your pet. Plenty of soft padding can help muffle the thumps and explosions, while if it is located away from windows, the effects of light flashes and strange shadows can be limited. By placing a favourite toy and plenty of treats in the den, your pet is more likely to feel safe, protected and secure despite what is happening outdoors. Put the radio and/or TV on at a reasonable volume from dusk to midnight and close all the curtains which will serve to muffle the sound of fireworks and block some of the light flashes from exploding fireworks respectively. If you are aware of a behavioural issue linked to loud noises, please book a consultation at Two By Two Veterinary Centre to discuss the options in good time prior to firework season. 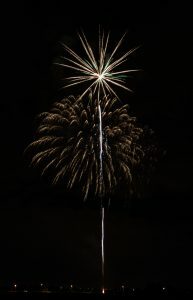 Also see our related blog post about treatment options for noise phobia and anxiety caused by fireworks.